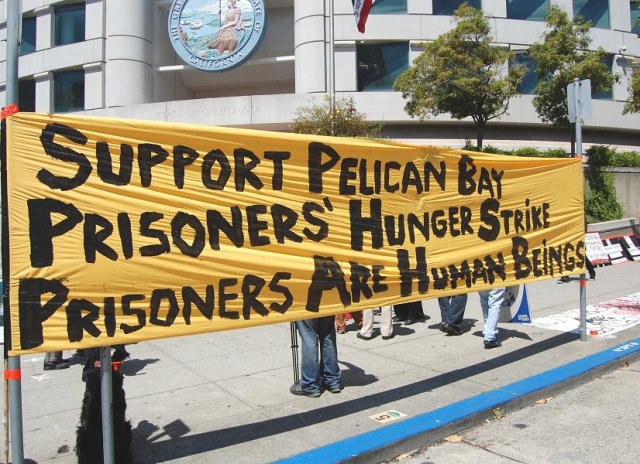 Thousands of human rights defenders gathered in cities across globe on Monday to observe International Day of Solidarity and Support for California Prisoners’ Hunger Strike and to support the strikers’ Five Core Demands. Before the debt deal vote was held in Washington on Monday, 22 people were arrested protesting House Speaker John Boehner from the chamber gallery. The protesters unveiled a large banner and shouted chants criticizing Republicans for opposing taxes on the wealthy. About 30 demonstrators occupied the Oregon State Department of Forestry office in Molalla on Monday to protest a timber sale in the Elliott State Forest near Coos Bay. Three people were arrested after they locked themselves together inside the office using modified pipes and refused to leave. Thousands of BBC radio journalists went on strike on Monday to protest against compulsory redundancies while management enjoy Prime Minister-style salaries and chauffeur-driven cars. Unionized concrete laborers without a contract since June stopped work for a second day yesterday at the World Trade Center site in lower Manhattan in protest over proposed wage cuts. In China, striking cab drivers in Hangzhou denouncing rising fuel prices and demanding the government make good on pledges to raise fares abandoned their vehicles for a second day on Tuesday. Striking Greek taxi owners stepped up protests Monday, blockading highways and a busy regional airport, after fresh negotiations with the government on new licensing laws collapsed. Four people were killed the morning of July 28 when provincial police forcibly evicted some 700 families from land they had been occupying in the city of Libertador General San Martín in the northwestern Argentine province of Jujuy. Hundreds of union members took to the streets Thursday in cities and towns around Swaziland to protest government moves to cut civil servants’ salaries amid a deepening financial crisis.